the SHOW TRIALS of TRUTH TELLERS. FUND-RAISING for VICTIMS of SHOW TRIALS, plus. I've always had several sides: the care-about-the-world side, the creative side, and the thinker side. The West is in danger on many fronts. One huge immediate danger is lawfare: the law used against someone who dares to speak out about anything negative re Islam. In April 2016, Tommy Robinson was almost certain to be thrown back into jail on trumped up charges. He had begged for isolation the first time, because of the threat of murder from Islamic violent offenders. That's how West in Danger got started. A call for help for Tommy - and a huge amazing response. 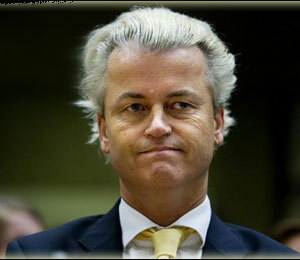 Then there was Geert Wilders, almost the prime minister of the Netherlands. He faced such a trial before and during the campaign. Show trials against dissidents, reminiscent of Stalin-era show trials, are rampant throughout the West. There is one huge difference between Stalin-era show trials and the current wave. Then the trials were used by the state to strengthen the state. Now in the West, the justice system is being used to damage and destroy Western freedoms, notably freedom of speech. The problem: Islamization. Most of the political elite, the mainstream media and the education system are attacking Western values rather than upholding them. It looks like an auto-immune disorder, where a person's defense system has been turned against the person. In this case, the culprit is easy to see: Islam, and the so-called politically correct, who act on the side of Islam and against Western freedoms. Here now: the beginning of an interview series with dissidents hit by show trials. Major figures. Local heroes. The first person to be interviews: Tim Burton, an unwitting and accidental hero. Also to be interviewed: Elisabeth Sabaditsch-Wolff, Tommy Robinson and perhaps even Geert Wilders. The show trials aren't the only concern of West in Danger. Is there any way we can establish who has peaceful intent?The mainstream media insists only a tiny percentage of Muslims have any non-peaceful intent. But is there some way to verify? Three friends think they have found the way: the Declaration of Peaceful Intent. Another major focus is the so-called education system, subverted in many ways into an indoctrination system. Many people have noted the dumbing down of education. At least as dangerous is the taboo on thinking. Yet another issue is the the Islamification of the curriculum. Plus, there's the blindness of the mainstream in the West to much of Islamic ideology - like al Walaa wal Baraa. How do we deal with all these "shark attacks" on human rights and freedoms? Click for the beginning of an answer. I remember the first time I was asked how one eats an elephant. I didn't have a clue. The answer (for people who would eat elephants): one bite at a time. That's how so many of us are dealing with the shark attacks. In this case, when help was sought for Tommy Robinson, the worldwide support was amazing. The immediate legal danger was fought off by top notch legal representation, made possible by the money that had been raised. As for the damage being done to students' ability to think, one proposal is a grass roots movement: R.A.N.T. - Rebels Against No Thinking. Plus there are two Guides to counter inaccurate mainstream portrayals of Islam, and the common view that negative information about Islam is irrelevant ("But I know a nice Muslim"). Most recently, a kids' video was done. Fun, easy, simple. Islamic ideology - including al Walaa was Waraa - in just 9 minutes. For ages 8 and up. Now available in 5 languages. This is just a drop in the bucket full of the efforts of people doing what we can to counter the threats to Western values, Western civilisation - to the West. safety, the capacity to think. And Stop the Show Trials - the Lawfare.